McManus' EDUCATION captures the legacy of the American 20th century – BOA Editions, Ltd.
Wilmott Magazine's Aaron Brown has high praise for The Education of a Poker Player, the new collection of linked stories from James McManus. In his thorough review of McManus' work, Brown examines closely "the legacy of three books whose honesty transcends factual truth," comparing McManus' Education with Herbert O. Yardley's The Education of a Poker Player and Henry Adams' The Education of Henry Adams. As Brown notes, these books share more than similar titles: "Taken together, these three The Education of books are an excellent way to understand the American 20th century from the people who lived it." While McManus' Education explores the merits of a Catholic education, the collection is more concerned with "that masterful exploration of experience," and with what can be learned at the poker table rather than in the classroom. Chronicling a young man's coming of age, "[McManus] accomplishes the difficult feat of making the narrator's voice completely believable as a child in the 1960s, but also thoroughly informed by subsequent events and acquired adult wisdom." Of the three poker books, Brown reserves his highest praise for McManus' Education: "McManus is a great novelist and poet, and his book is easily the best of the three on literary grounds. His stories are deeply humorous and stunningly insightful, finely crafted, and filled with phrases to be savored. But for all the differences of literary quality, all three books have a deep honesty that transcends factual truth, and all three books capture defining moments in the history of (so far) humankind’s most violent, eventful, and productive century in (so far) humankind’s most violent, eventful, and productive country.” Subscribe to Wilmott Magazine for the complete review. 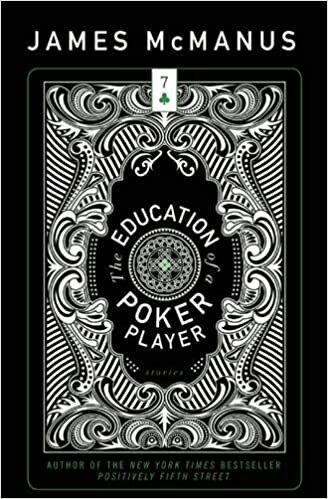 Out this month, The Education of a Poker Player is now in stock at the BOA Bookstore!